Announcing our new “Super Librarians”! Linda Bartley has been promoted to Youth Services Manager at the McCracken County Public Library. Linda has been with the library since 2003, working toward developing a stellar collection of youth materials for our community. She has many years of stand-up service and a number of library and archival certifications. She was featured in the People & Business section of the Paducah Sun on January 26, 2009. Congratulations to Linda Bartley in her newest endeavor. Heath Davis recently joined the library staff as an Adult Services Librarian. Heath comes to the McCracken County Public Library with 2 years of Adult Services Librarian experience, and a Masters in Library and Information Science. He will be working closely with our current Adult Service Librarians and the library’s computer, reference and circulation staff. Is your New Year’s resolution to spend less and read more? Let the Friends of the McCracken County Public Library help you on the road to self-improvement with their bi-annual Winter Used Book Sale! More than 5,000 donated titles are available for purchase at St. Paul Lutheran Church gym, at the corner of South 21st Street and Kentucky Avenue, Friday, January 25th, from 9 AM to 7 PM, and Saturday, January 26th, from 9 AM to 1 PM. Most hardback copies are $1 and most paperback books are 50 cents. Newer and collector titles, as well as Kentucky books, are discounted from retail price. All book sale payments may be made in cash or by check. Proceeds benefit the McCracken County Public Library. Each year, the Friends of the Library donate thousands of dollars to support the acquisition of new services, programs, and materials. Most of those funds come from used book sales in July and January. Last summer’s sale grossed $12,294 – a new record! In the last ten years, the Friends have donated in excess of $150,000 to the library. You can become a Friend today! 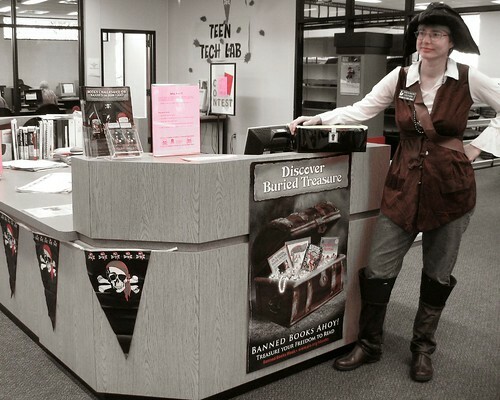 Make donations, help raise funds, or support the ongoing mission of the library. Sign up at the sale or by calling Friends of the Library President Maudine Buchanan at (270) 442-6263 or the library staff at (270) 442-2510.
free to read, originally uploaded by mclib dot net. What do you know about good citizenship? Do you know as much as the immigrants to our country? Teens can find out by taking our September Citizenship Quiz. For adults, try taking the test at MSNBC, Do you have what it takes to become a citizen? These are actual questions from the U.S. Naturalization Test. People from other countries who want to become U.S. citizens must pass this test. Do you know the answers? 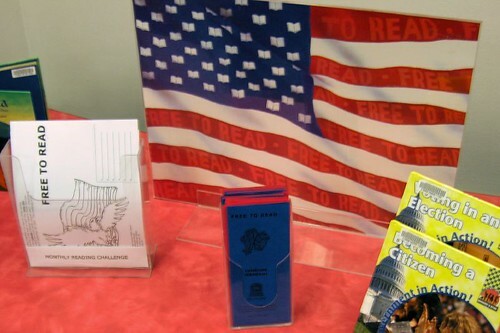 Stop by your library for color sheets and a list of good books about the USA for children too. Join us as we celebrate peace and freedom in honor of Patriot Day, in remembrance of 9/11, and as part of The September Project.